Our natural gas usage is shown in the following plot. The vertical blue line indicates the date of 01MAR2007 which was when we made a significant change in our habits or installed a solution, for details see below. The value of 46.5% indicates the percentage change after our improvement. The following plot shows month by month AVERAGE use prior to and since 01MAR2007 which is when we improved our solution within our home. These allow us to set the temperature of our home at specific times of the day. Basically, we heat our home when we need to, and do not heat it when we expect to be out or through the night when we sleep. We have a Natural Gas powered fireplace in our home. During the winter we sometimes use this for supplemental heating in our lounge. In the summer however we know we will not use it. Therefore, we turn off the gas supply to the Fireplace. The consequence of this is that when we turn the gas back on we need to light the pilot light, failure to do so would be a safety issue. At the end of February 2007 we installed a SDHW system. 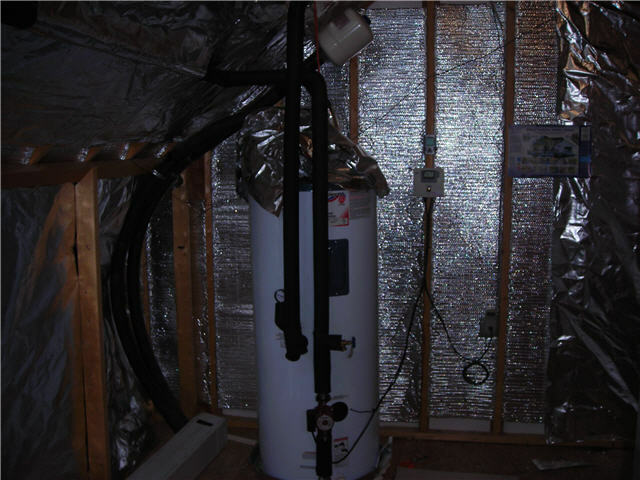 This system replaced a natural gas hot water heater. Our system is located in attic space, below our thermal collectors, of which we have two. Our Hot Water tank holds 80 gallons. In the event that we do not get sufficient solar heating of our water we have a supplemental ELECTRIC water heater INSIDE the 80 gallon tank. 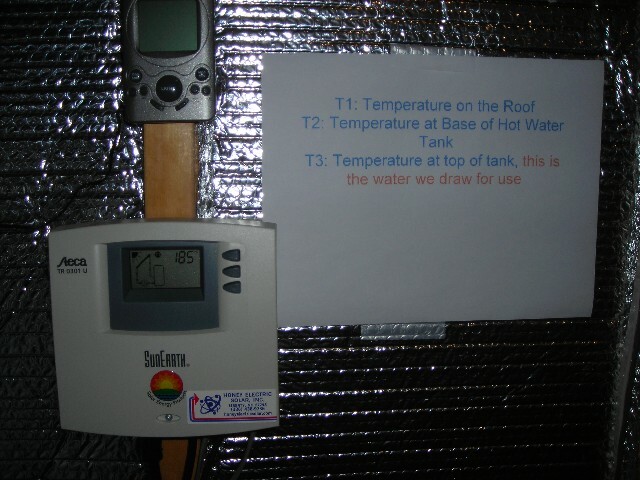 Our electric heater kicks in when the temperature drops to around 115 F, and will heat the water back to 120 F.
When we installed the system we expected to obtain 80% of our water heating from the sun. We have been fortunate to see slightly more than that to date. The remainder is heated by our Electric water heater. Details of our Hot Water energy savings are available through our Solar Roof pages.